JUMLA, June 30: Crusader for medical education reform and senior orthopedic surgeon Dr Govinda KC initiated his 15th fast-unto-death, in Jumla on Saturday afternoon. He began the hunger strike under police custody but was subsequently released . Police arrested KC after he landed in Jumla to protest against alternations made to the Medical Education Ordinance Replacement Bill, among other issues. Dr KC arrived in Jumla on Friday and he was arrested on Saturday afternoon while staging a protest in front of Jumla District Administration Office (DAO) . He was arrested on the ground that protests could not be staged in a prohibited zone. In light of Dr KC’s hunger strike, the DAO had issued a public notice banning any kind of strike including hunger strike, agitation or demonstration within 200 meters of the DAO, the district police office and the Karnali Institute of Health Sciences (KIHS). The doctor began his planned hunger strike while in police custody. The DAO then ordered his release, following protests by his supporters. According to relatives, the surgeon is currently on hunger strike inside the hall of the District Sports Development Committee. They accuse police of dumping the hunger striker inside the hall without making any arrangements. Dr KC had reached Jumla-based KIHS to stage his 15th fast-unto-death in protest against alleged tamperings with the medical education bill, and against the delay in starting an MBBS program at KIHS. He started the hunger strike at 2 pm at Jumla District Police Office where he was under custody. He has put forth a seven-point demand. The first demand is endorsement of the Medical Education Ordinance Replacement Bill by parliament without making any changes to it. Likewise, he has demanded the development of proper infrastructure and sufficient human resources at KIHS for its MBBS and other graduate programmes. He has also sought speedy construction of Rapti Academy of Health Sciences and Geta Medical College as well as establishment of government medical colleges in Panchthar-Ilam, Dadeldhura-Doti and Udayapur. Thirdly, he demanded the government reverse the decision to ban demonstrations at Maitighar Mandala in the capital. The fourth demand is action against officials associated with medical education who were deemed guilty by a judicial investigation commission. They should face action as recommended by the commission, he said. He has also demanded that the powers snatched from the Institute of Medicine (IOM) by Tribhuvan University should be reinstated to foster IOM’s autonomy. Another demand is implementation of standards for officials set by the University Grants Commission. Likewise, Dr KC has demanded scrapping of the Scholarship Management and Mobilization Procedures 2075 and enforcement of two years of compulsory service by post graduates whose studies were supported with scholarships. He further demands that all private institutions should provide cost-free medical masters degrees from the next academic year. In the seventh point, Dr KC has demanded arrest of those involved in leaving students of Janaki Medical College high and dry. The college is currently closed and its students face an uncertain future. 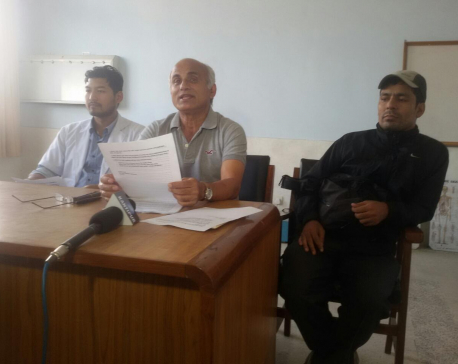 Dr KC has urged the government to make appropriate arrangements for them and to take the initiatives to open a government medical college in Province 2.